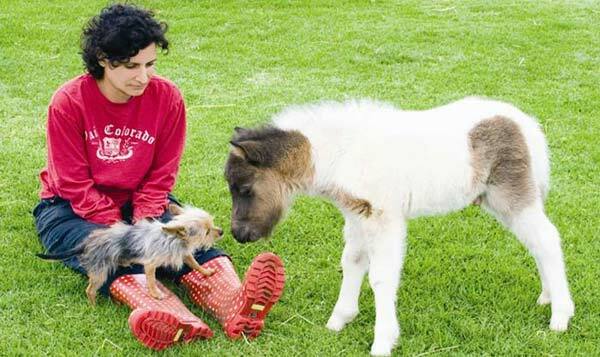 It’s important to understand the nutritional needs of Miniature Horses. Miniatures are prone to overeating and can develop problems from excessive food intake. 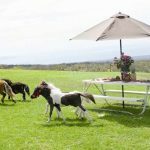 Nutrition for Miniature Horse is similar to that for large horses but the differences in body size must always be considered. 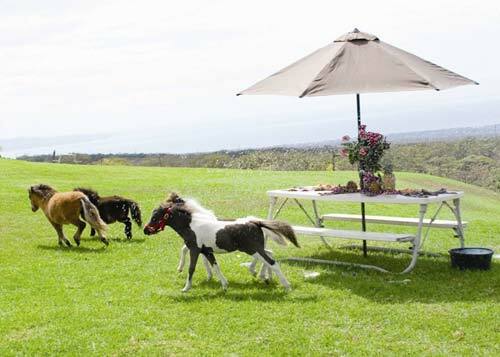 Miniature Horses will normally require a daily ration of grain and hay. Two feedings daily are the minimum when feeding Miniature Horses because of the size of their intestinal tract and the need for continual movement of food in their system. Plenty of clean water should always be available. Pasture access must be limited when the grass is long and lush or founder (a painful and crippling condition) may result. As with all horses, feeding should be tailored to the individual animal. Check with your veterinarian on an appropriate feeding program for your particular horse. Miniatures, though small, are hardy animals. They thrive on pasture, sunshine and room to run and play. 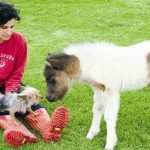 If you are not planning to show your American Miniature Horse, a three-sided, run-in shed for protection from cold winds and wet weather is usually sufficient shelter. During the show season, show horses are usually kept in individual stalls in a barn, but keep in mind they still need turn-out time to run and play. Hoof care in Miniature Horses is essential. Owners need to have young horses’ feet trimmed at an early age to help avoid any conformational problems. Hooves should be picked out every day and trimmed for balance on a regular schedule. Try to choose a farrier who specializes in working with Miniatures. Neglected or improperly trimmed feet can cause serious problems. 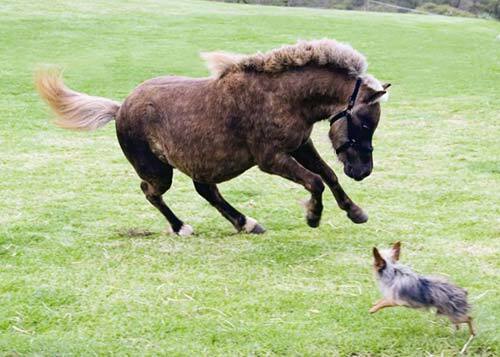 Miniature Horses should have their teeth checked at an early age. It is easier to do routine dental care rather than to wait until the teeth (and the problem) become challenges. Proper, routine dental care and maintenance is a very important aspect of horse ownership. Whether your American Miniature is a show horse, breeding stock, or companion, regular grooming is an essential aspect of his total care. Not only does the horse benefit from your grooming, he also becomes accustomed to your touch. This creates a special bond between you and your horse. While bathing is occasionally necessary and an important part of the process, Miniatures should not be bathed too frequently as bathing removes much of the natural oil from a horse’s coat. If you purchase an American Miniature Horse from someone in your area, ask that person to recommend a local veterinarian. You and your veterinarian will want to establish a comprehensive health program for your Miniature, which should include a regular immunization schedule. They type of immunizations required for your horse will vary depending on your intended use and geographic location. 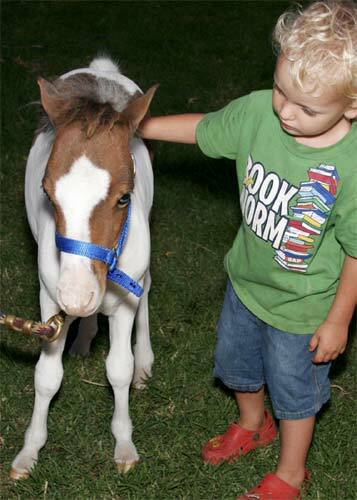 You will also need to develop a deworming program for your Miniature Horse. 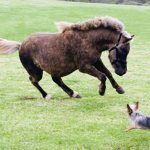 All horses are prone to internal parasites and these parasites can severely affect your Miniature Horse’s general health and performance if left unchecked. Your veterinarian will suggest a deworming schedule based on your horse’s living environment and geographic location. 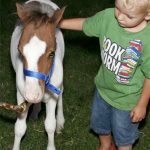 In general, it is a good idea to have a veterinarian who is familiar with your horse and his health history so the best possible care can be provided in an emergency situation.